As many fellow World of Warcraft players know, currently there are ongoing Demon Invasions in Azeroth in expectation of the Legion expansion. This pre-expansion event has started on August 9th and will end on August 30th, when Legion will be released. 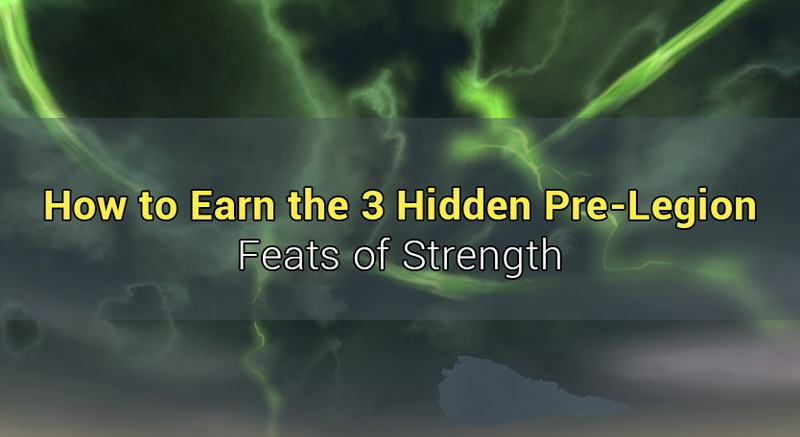 In preparation for Legion, we decided to write this little piece on how to obtain all 3 event related Feats of Strength, since once the new expansion goes live, they will become unobtainable. Defender of Azeroth: Legion Invasions. For earning this Feat of Strength, you need to obtain all 12 pamphlets from the doomsayers. These doomsayers can be found in both Stormwind City, for Alliance, as well as in Origrimmar, for the Horde. The idea behind is that once you speak to a doomsayer and he gives you a pamphlet, you’ll have a 15 minute cooldown before you can get another one, so instead of waiting it out, since it can take up to 50 or more attempts to get all 12 (you will get lots of duplicates), we’ll do a little trick. The most efficient way to earn it is by taking off all of your items (both from your character and bags), and deposit it in the bank. You want to do this so you avoid having all of your items damaged thus having to pay a huge repair bill. Once your character is naked, find a doomsayer that’s closest to the Spirit Healer, talk to them, receive the pamphlet, then mount up, go up in the air and dismount. The falling damage will one-shot you and will also remove the 15 minute cooldown so you can talk to one again. The requirement for the nearby Spirit Healer is because after a couple of attempts, you’ll reach the 2 minute resurrection timer, which you want to avoid by getting your body back at the Spirit Healer and having a 10 minute resurrection sickness debuff, which is no big deal. In fact, the lower your hp is, the faster you can do the quest. Once you’ve got all 12 pamphlets, you’ll earn the achievement automatically, without having to keep them in bags. You can sell / throw them out as you get them, since the criteria will be met for each pamphlet the moment you receive it. This Feat of Strength requires you to participate in all 6 invasions. It also contains a smaller version that also rewards the Stand Against the Legion feat, which requires you to defend a single invasion, however, by doing the former, you’ll earn both of them. Basically, all you need to do is to be in that specific region while the invasion is taking place, and there are only 2 invasions going on at the same time, either both on the same continent (Eastern Kingdoms or Kalimdor), or one on each. You don’t actually need to fight any of the mobs, meaning you can still be on your flying mount AFK while the invasion takes place and still get the loot rewards and the criteria for this achievement. However, fighting the mini-boss mobs will earn you about 5-8 Nethershards that can be exchanged for transmog items, items and a pet. The fastest way to earn Defender of Azeroth: Legion Invasions is to, oh well, be a mage. Or at least have a mage friend. If you don’t have a mage nor know anyone, the second fastest way is to do it on either a Demon Hunter or a freshly boosted character that you received from pre-purchasing Legion. The reason behind this is that both Demon Hunters and boosted characters have pretty much all the flight path locations learned already and you’ll have no issues going from invasion to invasion, even while being AFK, since for instance, if you take the flight path to the Tanaris invasion and then go to the bathroom, you’ll arrive in the invasion zone and will already get credit and loot for the ongoing fight. The invasions take place every 4 hours, and they come in pairs of 2 at the same time. The same ones will be on all of your other characters, as well as region-wide, so you can’t complete all 6 by jumping servers. It takes about 1-2 days to get all 6 of them and earn the Defender of Azeroth: Legion Invasions feat of strength, but there’s plenty of time since they’ll be available until August 30th. While all 3 Feats of Strength are very easy to complete, it’s recommended that you do them as soon as possible, since there might be hotfixes in place to make them a bit more difficult. For instance, having the 15 minute doomsayer cooldown persisting through death and making the actual participation in invasions mandatory, by actually fighting the mobs. On top of that, all the items purchased with Nethershards will become unobtainable once Legion goes live, so it’s best to get those transmogs and pet because you never know when you might make use of them! Hopefully you’ve enjoyed this post and found it useful, and if you have any other suggestions or information, don’t hesitate to let us know by leaving a comment! Have fun and cya in Legion!